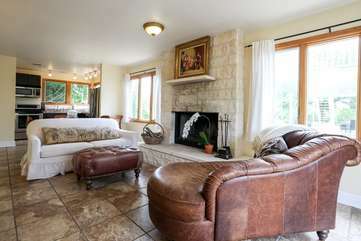 Located in the Texas hill country, Mockingbird House is the perfect retreat. Focusing on comfort, the Mockingbird House's mission is to provide a beautiful, peaceful and nature-oriented environment. Enjoy our clean and beautifully appointed suites while you see nature all around you. As hosts, we value all our visitors....be they human or animal. Our gardens, suites and land are designed to support the everyday needs and comforts of guests. Humans, deer, foster cats, miniature donkeys, armadillos, wide varieties of birds, possums, hummingbirds, butterflies and bees peacefully exist and thrive here. It's a slice of heaven here and we want to share that with you! HOST - Host lives on the property, but the suites are private. SLEEPS - Sleeps 4 in a queen size bed in the bedroom and a double sofa bed in the living area. Mockingbird House 1 is the ideal setting if you enjoy, quiet, nature, wildlife, comfort and tranquility. This lovely space is 7 miles or so from Fredericksburg in a rural area. We drove in the gate and were welcomed by 5 whitetail does grazing by the driveway. As we neared the property we immediately noticed the donkeys waiting to great us at the large careport. The space was cozy and clean. The living room and front patio faced west for great sunsets. The living room included a comfortable couch, television with cable, wood burning fireplace and windows looking out on a lovely meadow where wildlife was regularly seen. The kitchen had ample utensils for preparing meals which we did during our stay. The highlight of Mockingbird House 1 is the bedroom. The bed faces east. At the foot of the bed are double glass doors. Leave the curtains open. There is no one behind the property. The first light of the new day will wake you. Get up and make coffee for your partner.. Bring the coffee to bed. Open the doors and watch the sunrise. Enjoy the symphony of the songbirds as the sunrises in the cool of the morning. The donkeys will probably be eating birdseed below the feeder. You will probably have at least two cups before the sun forces your to close the curtains. Linda is a joy if you get the opportunity to visit with her. Stay here. It is an awesome space. It is quiet, comfortable, and as peaceful as any space in the Fredericksburg area. You won’t be disappointed. This is a little slice of Hill Country heaven. Perfect place to take time and recharge. Simple beauty with high quality amenities. Looking forward to coming back. A wonderful serene cottage with wonderful cats and donkeys. Very clean, private and great view of the animals. Beautiful sunsets. A charming ranch-style property just a few short miles outside of Fredericksburg proper. Linda is a sweet and gracious and very welcoming host, and you'll really love the accommodations and the peace and quiet. Would happily visit again! This place was perfect and the morning view from the bedroom is amazing! We enjoyed our stay at Mockingbird House and appreciated having such a cozy and comfortable play to stay. Waking up to deer grazing outside our windows and feeding carrots to Amelia and Jackson, the resident mini-donkeys, are memories we'll treasure always. It was such a peaceful place to stay. We loved being able to watch the deer each day and star gaze at night. The donkeys and cats that they have were so sweet. The house was very clean and had everything we needed. We enjoyed our stay here and we would definitely stay here again! Clean and quiet place not too far from town. Enjoyed seeing all the deers and donkeys in the morning. Would certainly book here again if I ever return to Fredericksburg! We loved our stay and being able to see the Milky Way from the back of the property. Waking up to the prancing deer was just an added and unexpected joy we found at Gästehaus Schmidt. We’d definitely visit again if the opportunity presented itself next year! Quiet, private area - very relaxing. Feels remote but only a short drive to town. Loved waking up and going to sleep with 5-6 deer hanging out in the yard. Wonderful space offering easy access to the city along with the privacy of and serenity of the country. Would recommend to all who are looking for a weekend away in Fredericksburg! The suite was clean, comfortable and quiet. We had a very enjoyable weekend. We enjoyed our stay and would visit again! Very nice home! Cozy home and adorable animals all around! loved our stay. our first time staying at the Mocking Bird House. the hospitality was outstanding!!! it was a great location with lots of elements of nature!! a beautiful place to stay in the lovely town of fredericksburg! We absolutely adored our stay here! It was the perfect distance from town, so we were able to enjoy the countryside while not being to far from Main Street. The house was charming, immaculate, and had thoughtful touches every where. The donkeys and cats were so friendly, and we saw several deer (including fawns!) every day and night. I would HIGHLY recommend staying here if your looking for a peaceful, romantic getaway. Thank you again to our hosts!! This place was so cute and quaint, perfect for a little getaway! We would highly recommend.